Seychellesbookings.com is the quickest and easiest way to book your Seychelles fast ferry tickets between the islands of Mahe, Praslin and La Digue. Seychellesbookings is a unique online booking system where you can check live seat availability, make instantly confirmed online bookings, and immediately receive e-tickets for your fast ferry reservations up to 48 hours before departure. Simply fill in your travel dates above, the number of travellers and the results will show you which ferries have seats available. You can also do the same for resorts, hotels and guesthouses in the region. Through our affiliation with both Agoda.com and Booking.com we offer a "Best Price Guarantee" giving you the best online rates for your Seychelles accommodation. For fast ferry tickets, payment can be made using your credit card or your PayPal account through PayPal's secure payment system. TIP: Check out the most common FAQ. Endorsed by the Seychelles Tourism Board, Seychellesbookings is the recommended place to book your Seychelles ferry tickets online. At Seychellesbookings we only work together with the leading fast ferry companies operating between Mahe, Praslin and La Digue. For more information about our fast ferry partners you can view their individual pages here: Cat Cocos and Inter Island Ferry. Seychelles Island Hopping has never been easier, book a fast ferry ticket to a Seychelles island, then book an island resort, hotel, villa or apartment on Mahe, Praslin or La Digue. No holiday to the Seychelles would be complete without experiencing more than one of its islands, and with regular fast ferry services operating between Mahe, Praslin and La Digue, there’s never been an easier way to do some Seychelles Island Hopping. Once you’ve seen the mountain peaks of Mahe, with its dense forests, sweeping bays and stretches of golden sand, you can jump on a Cat Cocos ferry to visit the towering palms of Praslin’s Vallée de Mai, the famous Anse Lazio beach and of course Curieuse island with its colony of Aldabra giant tortoises. From there it’s just a short hop over to the laid-back island of La Digue, aboard an Inter Island Ferry, where some of the most photographed beaches in the world lay in wait for you to discover. With each of the inner granite islands having its own geography, character and history, you’ll not want to miss out on a truly unforgettable experience. With Seychellesbookings.com you can book your fast ferry tickets as well as your accommodation all in one go so you can start planning your Seychelles Island Hopping adventure right away. To make it even easier, we’ve put together some suggested itineraries to give you an idea on how a visit to each of the islands can be combined into a trip of a lifetime. High-speed catamarans operate the ferry routes between the islands of Mahe, Praslin and La Digue, with crew training, operational standards and safety equipment all of the highest standards. Seychellesbookings only works together with the leading fast ferry companies to ensure your comfort and safety. With a choice of Economy or Business classes, air-conditioned cabins, hostess service, on-board refreshments and entertainment you can be sure of arriving at your destination relaxed and refreshed, ready to explore what the islands have to offer. Book through us for fast, safe and competitively priced services between Mahe, Praslin and La Digue. 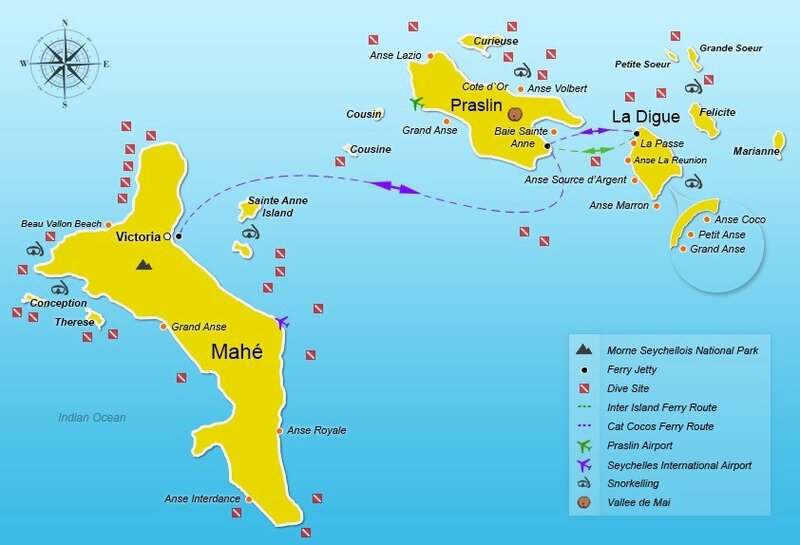 Mahe, Praslin and La Digue are the busiest and most developed of the Seychelles’ islands, and as a result, have the greatest concentration of accommodation; with Mahe having probably the best selection of resorts, hotels and restaurants. If you’re looking for a Seychelles resort, hotel, guesthouse or apartment then all you need to do is select where you would like to go, and what price range you prefer, and you'll instantly see our top recommended properties. Not only does Seychellesbookings.com give you access to competitive online rates for your Seychelles fast ferry tickets and accommodation, we also offer every customer the opportunity to make savings during their stay by selecting from our range of Special Offers. Seychellesbookings has negotiated a variety of discounts and special offers that could save you €€€ during your visit to the Seychelles. Check out our Diving Specials for discounts on dive excursions, introductory dives and courses. Pamper yourself with a discounted Spa Treatment, play a round of Golf at reduced rates, or take advantage of huge savings on Car Hire. All you need to do to qualify for our special offers is to book your fast ferry ticket with us. And best of all, you can choose as many offers as you like!